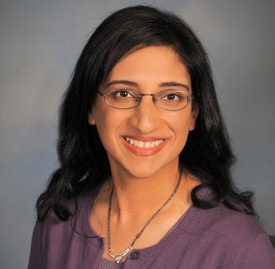 Dr. Rina Jain is originally from Canada and graduated from the University of Toronto medical school with honors in 1992. She completed a surgical internship and orthopaedic surgery residency at the University of Toronto. Dr. Jain has a special interest in the management of knee arthritis and hip arthritis, specializing in total hip replacement and knee replacements and revisions. She is also trained in robotic partial knee replacement surgery using the MAKOplasty system as well as Blue Belt Technologies robotic guidance. She was in practice at the University Health Network and then The Scarborough Hospital in Toronto prior to moving to San Diego in December 2002. Dr. Jain is certified by the Royal College of Physicians and Surgeons of Canada and the American Board of Orthopaedic Surgery. She is a fellow of the American Academy of Orthopaedic Surgeons, and has published many peer-reviewed papers. She received the Founder’s Medal from the Canadian Orthopaedic Association for best research presentation and the best research poster award from the Orthopaedic Trauma Association. Dr. Jain has also served as Chief of Staff at Sharp Grossmont Hospital from 2010 through 2012. Her practice includes general orthopaedics and total joint replacements.